As you may have noticed, I’ve been fairly absent from the blog for the last couple of weeks. I’ve had such a busy month, and blogging kind of fell on the back-burner as a result of it. So, I’ve decided to show y’all what I’ve been up to! I’m currently working as a front desk assistant at my university, and I absolutely love it so far! The majority of my job involves interacting with first year students who are living in residence – whether it’s answering their questions, signing out pool/ping pong equipment to them, or providing them with a spare set of keys when they’re locked out of their rooms at midnight (often in just a towel). One of my favourite parts of the job, though, is the whiteboard drawings. At the beginning of each shift, we get to update our whiteboard to make it uniquely “us.” It’s supposed to be welcoming, inviting, and occasionally informational, and it’s always a lot of fun planning out what your next creation is going to be. I’m also taking a few classes this term: biochemistry, French, and physiological psychology. They’re all really interesting so far (aside from biochem, since my prof isn’t the best), but between school and work, I’ve been kept incredibly busy! 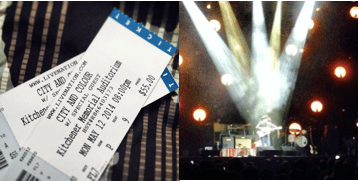 This month, I was lucky enough to see one of my favourite artists in concert: Dallas Green / City and Colour. It was one of the most perfect shows I’ve been to. The majority of my free time, though, has been spent painting my house, and that picture is a preview of my newly painted room. There are only a few rooms left to paint, and it looks so much nicer than it did in September when my roommates and I moved in. I have managed to sneak in a bit of reading time (and even got a Waterloo library card!) so now that I’m getting used to balancing this heavy workload, there will hopefully be more bookish posts coming your way soon!